The Arrow Glacier/Western breach ascends is closed until further notice. Unfortunately four hikers were fatally injured (during December 2005) due to unpredictable rock falls on this ascend route. For the moment, please consider one of the other ascend routes which all offers an amazing experience. We will inform as soon as the route re-opens. Remember your safety is our main concern. From the Arrow Glacier camp steep scree and rocky outcrops requiring a scramble lead up the Western Breach to the crater floor (5700m). This day will be the toughest challenge by far. After snowfalls the route can become icy and in these conditions an ice axe or ski stick may be required. When reaching the crater rim, you will be astonished by the view of snow and glaciers. Visible to you left is the Northern Ice fields of Kilimanjaro with the Furtwangler Glacier in front of you. Walk past this glacier to the Crater camp, situated at the crater rim. If time permits, you can climb to the Ash Pit (1 ½ hour). The Ash Pit is 340m across, 120m deep and is one of the most perfect-formed examples in the world. The campsite is very cold as snow might occur. 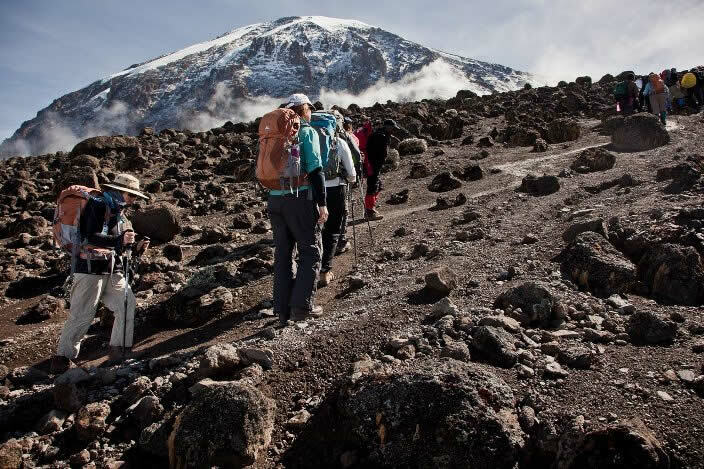 Be one of a fortunate few to spend a night in the inner crater of Kilimanjaro. You will rise around 04:00, and after some tea and biscuits you shuffle off into the early morning darkness. From the crater floor you will probably encounter snow all the way on your 2-hour ascent to Uhuru Peak. Time spend on the summit will depend on the weather conditions. Do not stop here for too long, as it will be extremely difficult to start again due to cold and fatigue. Enjoy your accomplishment and a day to remember for the rest of your live. The walk to Barafu camp from the summit, takes about 3 hours. Here you will have a well earned but short rest, before heading down to Millennium camp (3100m). The route is not difficult and will take you down the rock and scree path into the moorland and eventually into the forest. The camp is situated in the upper forest and mist or rain can be expected in the late afternoon. Dinner, and washing water will be provided as well as drinking water. After an early and well-deserved breakfast, it is a 5-hour, scenic hike back to the Park gate. It is strongly recommended to pay your porters any tips after you and all your gear have reached the gate safely. Click here for more info on tips. At Mweka gate you sign your name and details in a register. This is also where successful climbers receive their summit certificates. Those climbers who reached Stella Point (5685m) are issued with green certificates and those who reached Uhuru Peak (5895m) receive gold certificates. From the Mweka Gate you will continue down into the Mweka village, normally a muddy 3 km (1 hour) hike. In the Mweka village you will be served a delicious hot lunch!! You will then drive back to Moshi for a long overdue hot shower and celebrations!! Overnight in Springlands hotel.